WHY SHOULD WE WIN? ..... Our image is not just a scene of static objects, tonnes of material characteristics and coordinate mapped surfaces. Our scene is an amalgamation of science and art focusing on the phenomenon and the artistic qualities at the same time. We spent a lot of time in modelling the shape, structure, curves and randomization of the plasma and our Volume integrator spends a lot more time trying to tie 80 instances of the object into one scene. We built volume rendering solids, volume integrator, renderer and no materials or objects were used from third party applications. Rendering volumes such as fog, fire, clouds, plasma etc. is slightly more complicated than rendering simple solid objects with surface interactions i.e. INTERSECTION with the RAY. Implementations representing scattering, absorption and emission occur between surfaces. Since Volumetric effects are parameterized with the length/gradient of the object the BRDF function to render volumes is an integral function of Absorption, Emission and Scattering charestictics of the material. Volumetric particles can be defined as homogeneous or heterogeneous, which dictates if the material and properties are uniform throughout the solid or varying. Technically, all of these phenomenon are due to interaction with microscopic particles, but we implment a less cumbersome way than calculating interactions individually. 1. Absorption : the reduction of radiance due to the sub-particles which absorb the light along the ray path. 2. Scattering : along the ray path, radiance is scattered due to collision with particles. 3. Emission : radiance is added into the path of ray by sub-particles due to material properties. 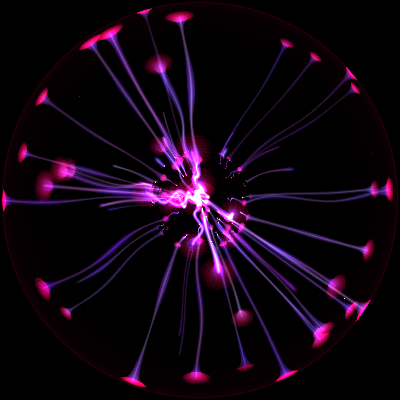 Each volume object simulates of light emitting plasma when high voltage is discharged through neon gas. We simulate 82 synapse connecting inner sphere with the out sphere, each contributing to volumetric emission. Ray marching through the object is a very time consuming and computationally expensive process. The computation time is a factor or ray-marching step size, so is the realism of the emission in the scene. To make the computation manageable in a personal computer environment, we introduce RAY MARCHING. With an appropriate step size, the cast ray acquires light which is put together in the Volume Integrator. The technique for volume ray casting can be derived directly from BRDF rendering equation. An integral step rendering equation will result in a very high quality render image, but an integral equation would be computationally very expensive. The volume integrator casts ray through the volume, along the direction of the ray, sampling in appropriate step size is performed. For each instance of the sample that lies inside the volume, the ray acquires RGB color from the volume properties. 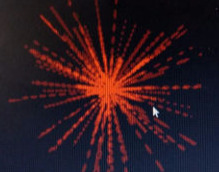 After all sampling points have been calculated, for all rays cast, the resulting final color value is computed for the pixel. With a front-to-back approach, the integrator does not perform ray marching for intersection incidents, beyond depth level 1. Upon intersection of the ray, a reflected ray is marched along the mirrored path which samples the reflection of synapse on the inner sphere. This gives the inner sphere a polished reflective surface, like a metallic electrode. 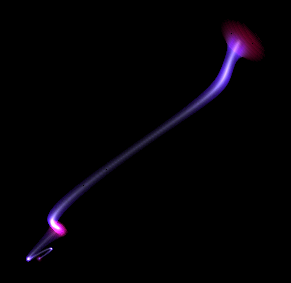 Volumetric emission object from point A to B radially outwards, Synapses. Random amplitude and frequency modulation along the length of Synapse. Exponential expansion along the endpoints of the Synapse. 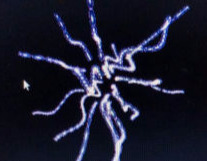 Reflected ray is traced and reflection of the Synapse is seen on the Electrode. Diffused light along the uuter sphere surface causes the sphere to glow. We are Group-R : Param Uttarwar and Atul Anand Jha students of MS in Visual Computing and MS Computer Science respectively. One expensive laptop was electocuted during the inception and discharge of the Plasma Sphere.